Twisted by the Wind is a collection of stories and words of wisdom, with a fair amount of humor added. Twisted by the Wind is a collection of stories and words of wisdom, with a fair amount of humor added. It chronicles a philosophical spirit developed on the plains of Oklahoma, the Arizona desert, Nashville, and the wine country of California, honed through a lifetime of entrepreneurial endeavors and adventures. Tales of first flights, free meals in the park, car racing, life in a monastery, following a musical dream, and wisdom of the ages are all wrapped in a collection of quotes, short stories, poems, and personal revelations. Designed to be a catalyst to spark readers' inspiration and creativity, you can open this book anywhere and find a fresh thought or idea to make life more enjoyable and to share with others. ¡¡Aprender Los Sonidos Del Inglés!! Now ... for the first time! 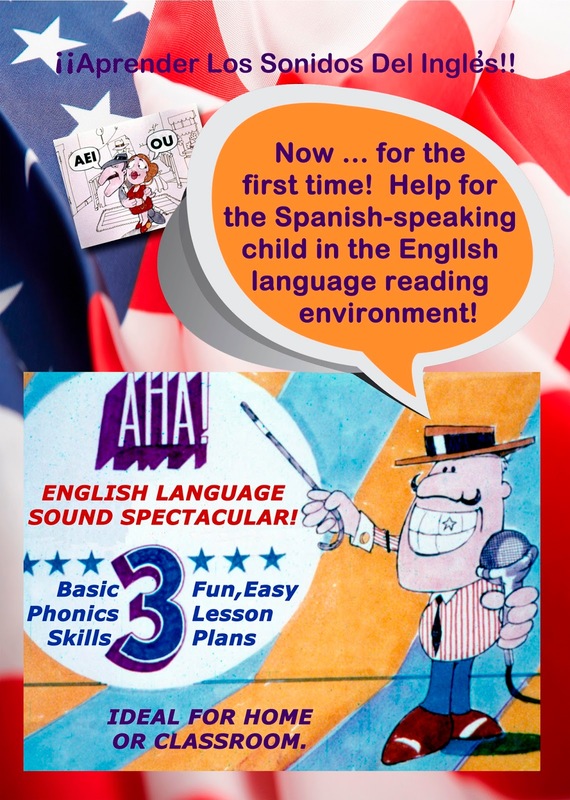 Help for the Spanish-speaking child in the English language reading environment! Available on DVD. child is most comfortable, the concept of decoding. 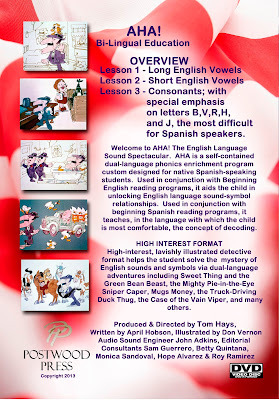 High-interest, lavishly illustrated detective format helps the student solve the mystery of English sounds and symbols via dual-language adventures including Sweet Thing and the Green Bean Beast, the Mighty Pie-in-the-Eye Sniper Caper, Mugs Money, the Truck-Driving Duck Thug, the Case of the Vain Viper, and many others. Order Aha! English Language Sound Spectacular at https://www.createspace.com/371449 or thru Amazon and other DVD sellers. ¡¡Aprender Los Sonidos Del Inglés! Ahora ... por primera vez! Ayuda para el niño de habla española en el idioma Inglés entorno de lectura! Disponible en DVD. Bienvenido a AHA! 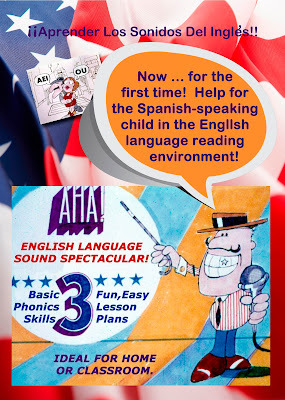 Espectacular El Idioma Inglés Sound. AHA! es un programa personalizado autónomo bilingüe fonética enriquecimiento diseñada para los estudiantes de habla española de origen. Utilizado junto con el comienzo de los programas de lectura en inglés, que ayuda al niño en el desbloqueo de inglés relaciones entre sonidos y símbolos. Utilizado junto con el comienzo de los programas de lectura en español, que enseña en el idioma con el que el niño se sienta más cómodo, el concepto de decodificación. GRAN FORMATO INTERÉS alto interés, formato detective profusamente ilustrado ayuda al estudiante a resolver el misterio de los sonidos y los símbolos en inglés a través de aventuras en dos idiomas como Sweet Thing y la bestia de la haba verde, el Poderoso Pie-en-el-ojo Francotirador Caper, tazas Dinero , el pato Thug Truck-Driving, el caso de la víbora Vain, y muchos otros. Lección 1 - Long Inglés Vocales Lección 2 - Short Inglés Vocales Lección 3 - Las consonantes, con especial énfasis en las letras B, V, R, H y J, el más difícil para los hispanohablantes. Ordene Ajá! Idioma Inglés Sound Spectacular en https://www.createspace.com/371449 oa través de Amazon y otros vendedores de DVD. Here's the Pearl of the Day! SEEDS INTO THE WIND - One Thousand Days of Timeless Wisdom is a collection of over one thousand inspirational, motivational, witty and sometimes humorous quotations selected from “Here’s Your Pearl of the Day® from Tom Hays”, a daily “thought starter” email sent to subscribers and featured on selected websites for over seventeen years. The book features quotations from famous and infamous thinkers throughout history to the present day. Readers are encouraged to, each day, choose a random number between one and one thousand, look up that numbered quotation in the book and see what "Pearl of Wisdom" fate brings them that day. Order autographed copies from writer. Special Gift Pricing Now! Tom Hays is an artist and writer and a serial entrepreneur, previously owning and operating a variety of business ventures. 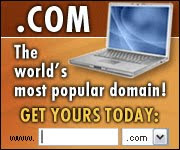 Tom also compiles and publishes quotations through his website, PearloftheDay.com, which emails inspirational and motivational quotes to subscribers daily at no charge. He established this ministry more than ten years ago, and it has grown to hundreds of recipients daily plus thousands of readers on various websites where the "Pearl of the Day" appears. Tom has been in the retail optical business, owned an advertising agency, an audio/visual production company, built a chain of thirty-eight automobile quick oil-change centers, started a food packaging and marketing company, and owned a market research company, conducting radio listenership research in 105 radio markets in the United States. He was also a principal in several other private and publicly owned companies, including those involved in oil and gas exploration, music production, greeting cards, and business acquisition. He is also an ordained minister. Born in Oklahoma and having lived in Nashville, Tennessee, and the Napa Valley in California, Tom and his wife Susan currently make their home in Scottsdale, Arizona. 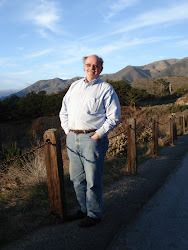 Tom enjoys painting, silversmithing, ceramics, design, songwriting, website development, and writing stories. 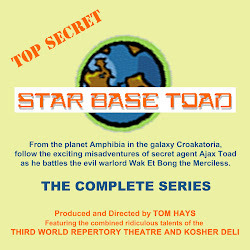 Copyright Tom Hays 2010. Powered by Blogger.